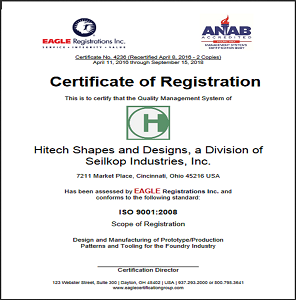 HITECH Shapes and Designs, a division of Seilkop Industries, Inc., offers high production to prototype and foundry tooling and fabrication services. In-house prototyping capabilities extend beyond simple SLA printing to offer a more realistic representation of the production casting, including the required draft. Designers and engineers are experienced in all modern modeling CAD systems including Pro-E and SolidWorks to accommodate the customers’ design work into our system. QuickCAST is our proprietary simulation software that can model the entire casting process and pinpoint any expected issues in the part or tooling prior to manufacturing. This extensive prototyping and analysis saves time and money during the tooling fabrication and preproduction verification phases. We have a full in-house pattern shop capable of designing and fabricating patterns and cores for virtually all casting systems including vertical and horizontal DISA, Sinto, and Hunter patterns. Patterns can be fabricated for sand casting, permanent mold, or shell mold applications. Core equipment includes Redford, Harrison, Laempe, and Hottinger core machines for both hot and cold core box manufacturing. All tooling is CNC machined to precision tolerances from cast iron, steel, aluminum, urethane, hardwood, or plastic. Turning centers are equipped with live tooling and capable of turning material up to 12” in diameter. Milling centers have a cutting diameter of 20” and can machine parts up to 54" x 30" x 26". We are an ISO 9001:2008 certified company and have been an industry leader in the production of foundry tooling since 1946. Our customers include the automotive, compressor, marine, and pump component industries. For more information about our prototype sand casting and mold manufacturing capability, see the table below, or contact us directly.